Constructors of quality farm, agricultural and machinery shedding. 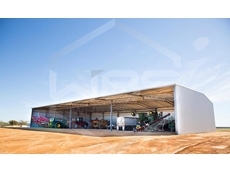 Pre-fab or made to measure horse stables, aircraft hangers, large industrial buildings. Splash Structures offers a range of temporary buildings solutions that can be used for various applications. These building structures can be used as airplane hangars, sheds and animal enclosures. 01/07/11 - Ozsteel Garages and Sheds manufactures industrial sheds to suit applications ranging from mini storage units to aircraft hangars. 01/08/08 - JW Building Systems specialise in offering sheds, complexes and stock shelters. 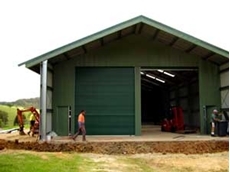 The sheds from JW Building Systems are manufactured using a range of galvanised steel materials. 31/07/08 - Spanmaster offers the Ranbuild Hangars series of commercial sheds. These commercial sheds have been designed for the protection of aircrafts. 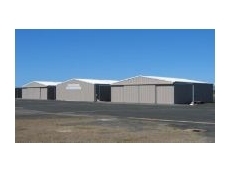 Ranbuild Hangars commercial sheds are known for their durability and reliability. 30/07/08 - Spanmaster supplies Ranbuild commercial sheds, suitable for a diverse range of applications. Ranbuild Schoolmaster type of commercial sheds have been specifically designed to provide protection against various external elements. 29/07/08 - Ranbuild commercial sheds from Spanmaster are available in different types. The Ranbuild Covermaster series of commercial sheds consist of an engineered frame suitable for different locations and applications. 17/08/06 - Ranbuild Airmaster series of hangars are the best possible choice for protection of your aeroplane. No matter what make or model of light aircraft you have, there is an Airmaster hangar to suit.